Like clockwork, Jose Mourinho once again looks a great bet to win the league in his second season at a club. Taking away some of the sheen is the fact that there isn’t really any decent competition, but also that Chelsea themselves aren’t particularly good. Despite their winning start to the season, it first became clear Chelsea weren’t as strong as suggested when they were largely outplayed in their 2-1 win over Liverpool. This was before Liverpool’s recent revival, only overcoming what was still a terrible Liverpool side due to some typically terrible defending. Manchester City caught up with them as they wrestled with the busy Christmas schedule but Chelsea have once again pulled away at the top of the league. 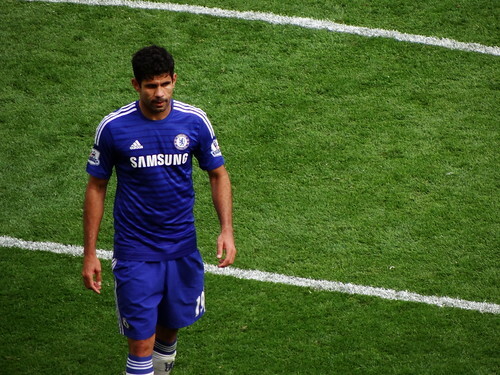 Moving with great efficiency in the summer transfer window, Chelsea sorted out the key issues in their team. Diego Costa joined to bolster what had been a mediocre forward line since Didier Drogba first left, Cesc Fabregas was brought to add more creativity to a stale midfield and Thibaut Courtois and Filipe Luis added extra quality to already relatively strong positions. On paper there’s no real weaknesses any more, so why aren’t Chelsea setting the world alight? Part of the problem is balance. Unusually for Mourinho, he’s got his attackers to press from the front semi-regularly. It has its benefits – the way they forced Liverpool into using Simon Mignolet’s terrible kicking was a notable high point – but a defensive partnership of 34 year-old John Terry and slow-to-turn Gary Cahill definitely limits its usefulness. As the disappointing tenure of Andre Villas-Boas showed, Terry no longer has the legs to push up in a high line, so rather than letting opposition strikers run in behind them, they sit deep. 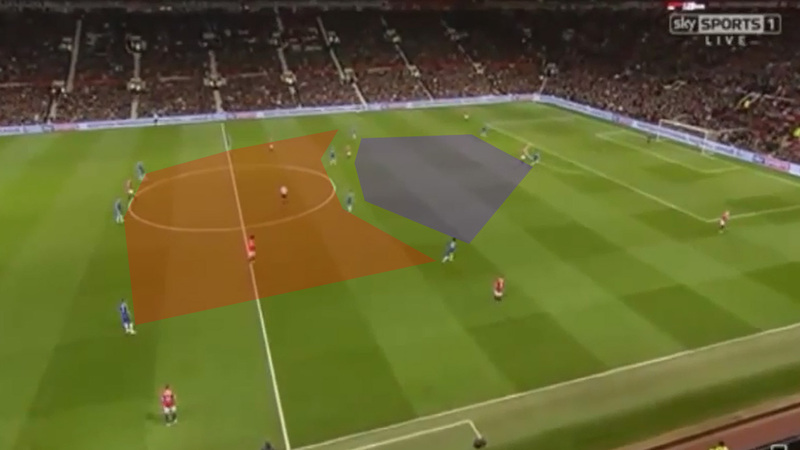 With Chelsea attackers pressing though, this opens up the midfield area of the pitch. Nemanja Matic does a good job of holding on the toes of Terry and Cahill, but this is simply too big an area for him to cover by himself, especially as Fabregas isn’t particularly strong defensively. It isn’t just from front-to-back that Chelsea get stretched. With Willian frequently moving out towards the left when Chelsea are in possession and Branislav Ivanovic pushing far forward to compensate for the lack of width, Chelsea can be left exposed on their right side. This was clear in their first defeat of the Premier League season to Newcastle and was brazenly exploited in their 5-3 loss to Tottenham, where Danny Rose and Nacer Chadli positioned themselves high up on the wing and Christian Eriksen and Harry Kane made runs to the left to overload that side. Given Mourinho is so famously pragmatic, why is it that he hasn’t addressed these weaknesses? The most likely answer is that the set-up is unbalanced for a specific reason: to give support to their best player, Eden Hazard. Willian and Oscar buzz around the Belgian, Diego Costa makes runs ahead of him and now he has Filipe Luis getting forward behind him (although Cesar Azpilicueta has been the superior left-back this season, given some issues with Luis bedding in defensively). And yet, although Hazard is without doubt one of the best players in the league, have his performances really justified the way the team has been built to get the best from him? Hazard’s still one of the world’s hottest talents, yet he hasn’t really improved as much as expected when he first joined. That isn’t to say he’s still raw – he arrived at Stamford Bridge comparatively polished – but that when he’s made clear his dreams of emulating Lionel Messi and Cristiano Ronaldo you would have expected him to be closer to doing it by now. The issue with this kind of criticism is that there’s clearly not actually anything wrong with the way Hazard plays football. You could question his defending, as Mourinho has done, but that’s ignoring what his actual purpose is, especially when Chelsea are making an extra effort to accommodate him. At that level, what’s needed are slight alterations to allow him to make the best of those already existing abilities rather than real technical improvements. Paying close attention to Hazard, it quickly becomes noticeable how frequently play stops upon reaching him. Most first touches result in him being immediately stood up by a defender and playing it back towards his half way line – all because of the way he receives the ball. Hazard has a good left foot, but it’s remarkable how rarely he uses it – even when going outside of the full-back he resorts to little touches with the outside of his right foot. Playing on the left, his need to control the ball on his right foot means that he’s nearly always facing backwards with the ball behind him when he first receives it. Slowed down, it’s not difficult for a defender to get cover and stand him up, meaning Hazard has two options: play a risky ball inside into an already covered area, go outside on his weaker foot or send it backwards. Watch any game and his most incisive moments always either come on the counter, because those are the few times he has space to run into, or in the middle or right, because he can receive the ball facing goal and get straight at the heart of the opposition defence. Mourinho has spoken constantly of his side’s need to develop a “killer instinct” but rather than fixating his team on Hazard, his best bet at doing this might be to just quicken his best attacker’s play. Given Oscar hasn’t developed as expected either, moving Hazard into a more direct position in the middle as Brendan Rodgers did last year with Raheem Sterling could be a worthwhile experiment. Regardless, it’s obvious Chelsea simply don’t dominate the opposition like they did in Mourinho’s first spell. Their first choice line-up fails to get the right defensive cover and the alternative with John Obi Mikel partnering Matic in the double pivot fails to offer any attacking threat. A more incisive attack and some quicker defenders would do them the world of good. Good article,biggest problem for Chelsea is Fabregas i think. Not defensively accomplished enough to play in a double pivot and doesn’t cover the right flank. Willian’s role is a bit strange i feel,like you mentioned he drifts inside but leaves the right flank open and with Cesc generally on the right of the double pivot Chelsea are fully exposed down that side. I’d definitely concur he’s a major part of it but who do you replace him with? John Obi Mikel and Ramires don’t provide enough attacking thrust. Given Oscar’s been underwhelming, I was thinking it would be interesting to see how he did in front of the pivot if they could find an upgrade on the other two to go with Matic, like where he played with Arsenal, but I think it would be more interesting to see how Hazard would do there if given a chance.